Bills head coach Doug Marrone cut a respected player in the locker room in Tashard Choice. Marrone respected him to which is why he took the time to explain to Choice why he was releasing him. “I talked to Tashard,” said Marrone. “Normally those are private conversations, but what I told him was he did not do anything that made us look to do it; it was more of a sense of us trying to better ourselves. “I’ve always appreciated his enthusiasm here. I’ve always appreciated the way he’s gone to work here. But at the end of the day, it happens quite a bit in this business, and it is a business of making sure that you win and you get better. With C.J. Spiller still not 100 percent with his ailing ankle and Fred Jackson still fighting through a sprained MCL, here’s how the running back breakdown went on offense Sunday against Miami. Buffalo went with a three-pronged approach at running back and even got FB Frank Summers involved as he got a couple of carries Sunday. It’s not the most important part of their game Thursday night. They want to play their best to get a win first and foremost. But there is a part of them that wants to prove they are not the same old Bills knowing a national audience is watching. Spiller is still a question mark for the game, but Buffalo won in Cleveland last season in Week 3 without an injured Fred Jackson and with Spiller suffering a shoulder injury in the first half. In that game Tashard Choice ran for 91 yards on 20 carries (4.6 avg.) in a 24-14 Bills victory. The battle for the third running back spot on Buffalo’s roster has been tight. Tashard Choice is widely seen with the edge going into tonight’s preseason finale, but Kendall Gaskins and Zach Brown are in close pursuit. Here’s a look at how the reps through the three preseason games have played out, knowing Brown and Gaskins figure to get a big dose of work tonight. Gaskins, who has the fewest offensive snaps to this point, is hoping extra snaps will allow him to get into the flow of the game more effectively. Here during OTAs there are a few kick return candidates on the roster and special teams coordinator Danny Crossman is not short on talent. Taking reps on kick return in OTAs this week were Marquise Goodwin, T.J. Graham, Brad Smith and Tashard Choice. Leodis McKelvin has been mentioned as an option as well, but he’s been limited to just individual position drill work in practices coming off his groin surgery earlier this offseason. Nevertheless the speed quota is more than filled in the return game for Buffalo. 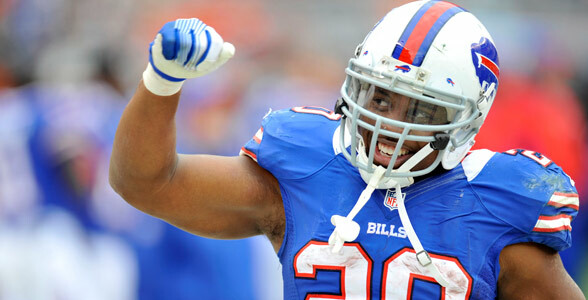 He didn’t provide details, but free agent RB Tashard Choice said he’ll be back with the Bills in 2013. That according to his Twitter account. Choice is expected to again serve as the team’s 3rd running back behind C.J. Spiller and Fred Jackson. ESPN NFL analyst and former NFL GM Bill Polian put together his list of top free agent talent set to hit the market in mid-March and two Bills appear near the top of his list. Polian graded pending free agents with A, B and C grades. Here’s how he valued those grades in terms of investment. A Players: Worth paying big, starter-caliber money. B Players: Guys I would sign but only if the value made sense. C Players: Guys I’d sign for low-salary, short-term (one or two years) value, with low bonuses. Appearing on his ‘A’ list for offense was Bills free agent G Andy Levitre, who was listed 8th overall on the offensive side. Here’s Polian’s assessment. Player Analysis: Levitre is a very solid, professional, strong, offensive guard. While he has the talent, his position might limit the money he’ll see. Appearing on his ‘A’ list for defense was Bills free agent S Jairus Byrd, who ranked 12th on the defensive list. Player Analysis: Timed speed is a question mark, but instincts, toughness and production are not. The only other Bills that appeared on Polian’s free agent list were Leodis McKelvin (B grade – but injury concerns) and Tashard Choice (C grade). With Fred Jackson now lost for the season with a sprained MCL Buffalo is down to a pair of running backs in C.J. Spiller and Tashard Choice. When asked if the Bills might make a roster move to add a third back, head coach Chan Gailey said it’s one of their considerations. The other consideration is to make use of FB Corey McIntyre. McIntyre does not have a carry on the season, but he does have one reception for nine yards. Bad enough that Patriots LB Brandon Spikes had an illegal helmet to helmet hit on Ryan Fitzpatrick that drew a flag and a likely fine from the league. Spikes also showboated after his hit on Fred Jackson that have him a concussion. That didn’t sit well with Tashard Choice. There are a couple of player radio appearances on the airwaves by the Bills today. Here’s the rundown. We’ll take some time to review the Bills win in Cleveland tonight on The John Murphy Show. Along with the news of the day, we’ll have Bills Rewind in our first segment at 7pm. We’ve got the radio play by play highlights of the 24-14 victory, along with reaction from the Bills locker room. 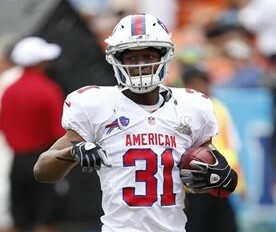 At 7:20pm, Bills RB Tashard Choice joins us in studio. He ran for 91 yards on Sunday, and we’ll ask him about being ready to play and what it’s like to back up C.J. Spiller and Fred Jackson. Our Bills network sideline reporter Joe Buscaglia is live with us at 8pm to give us the view from the Cleveland sideline yesterday. And then Chris Brown of BuffaloBills.com joins us in studio for a review of the game, and discussion about the injuries to Spiller and Jackson. The John Murphy Show airs weeknights from 7pm-9pm on the flagship station of the Buffalo Bills, WGR Sports Radio 550. As is customary this time of year when roster cuts are made more numbers become available players make jersey number changes. Tashard Choice is the latest to do so. Choice has changed his jersey number to 20. He had been 29. RB Tashard Choice, who agreed to re-sign with the Bills Saturday, is only going to add to the competition in Buffalo’s offensive backfield. Fred Jackson and C.J. Spiller are the two primary backs and that’s very unlikely to change. However, Choice will be part of a third back competition that also includes former fifth-round pick Johnny White. Chicago Bears WR Sam Hurd was arrested by federal agents Thursday on major drug trafficking charges. His former teammate with the Dallas Cowboys for three seasons, Tashard Choice was stunned by the news. Choice took the time to read the entire affidavit of Hurd’s case online and saw that the feds were investigating Hurd since July. Tashard Choice may have only practiced twice since being signed by the Bills on Wednesday, but his retention of Buffalo’s offensive system will give him a very good chance of getting on the field today against the Jets. “He retained a lot,” said head coach Chan Gailey. Gailey, who coached Choice for his last three seasons of college at Georgia Tech, has a lot of the same terminology for his offense with the Bills that he had at Georgia Tech. Don’t be shocked if Choice serves as a third-down back in passing situations against the Jets. Newly signed RB Tashard Choice practiced Thursday and was glad to see some familiar faces. Choice also is familiar with some of the offensive scheme. Knowing there’s a chance he could be in the Bills game day lineup soon Choice is anxious to get up to speed completely. Not only does Tashard Choice have a connection with Buffalo already having played for head coach Chan Gailey in college. A former relative of his played running back for the Bills. Choice’s cousin Joe Burns, was a reserve running back for Buffalo from 2002-2006 serving mostly on special teams. Burns also played his college ball at Georgia Tech. Burns appeared in 58 games for the Bills and had 64 carries for 193 yards. His only touchdown for Buffalo came on a 19-yard reception. According to ESPN’s Adam Schefter the Bills have claimed RB Tashard Choice off waivers from Washington. AdamSchefter And one more waiver claim: Bills claimed former Redskins running back Tashard Choice on waivers today.